Help Jerit Fight Cancer !! This post is for one of my close friends, Josh Jerit Zion. For all those who know him, you would have seen him as a person who always has been there for his friends at any point of time. For those who don't know him, Jerit at 29 years, is the sole bread winner for his family. 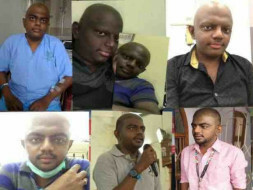 2 years back, he was diagnosed with a rare case of 'Blood Cancer' (Acute Lymphoblastic Leukaemia). From then on, he has been under tremendous pain (both physically and mentally). He decided to fight the disease against all the odds that he faced and with outside financial help, he was able to complete the first leg of his medical treatment last year. Now, the doctors have advised for Donor Lymphocyte Infusion (DLI) followed by Nivolumab Chemotheraphy as the next big step in this process. This would cost us around 12 lakhs and we have only 3-5 weeks' time to arrange for this amount. We request everyone possible to contribute whatever amount you can for this purpose and help our beloved friend successfully get rid of this disease once for all. Let's stand together with Jerit at this hour and do all that is possible for this cause. Please feel free to ping incase you need any clarification. 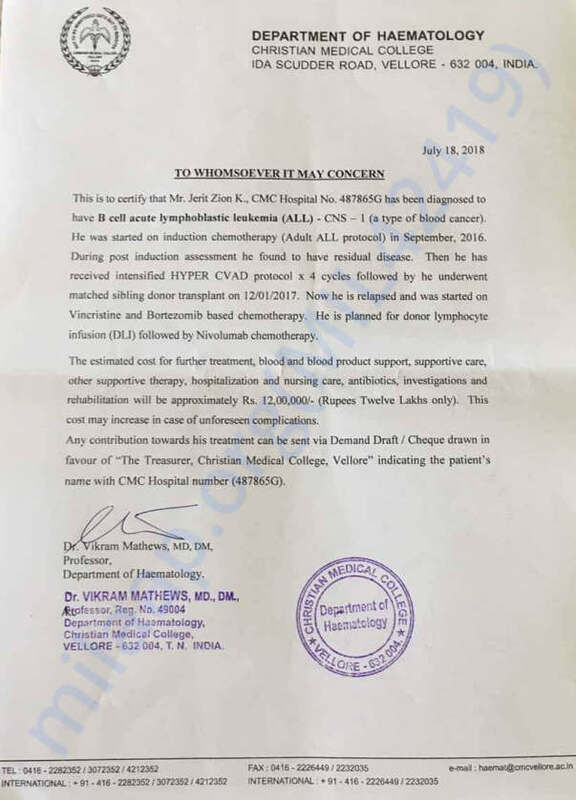 We are also attaching the letter from his doctor regarding his treatment. I am grateful to all of you for the love and support given to Jerit. He is presently at home and is doing better. He has been visiting the hospital for regular check ups. The doctors are waiting for a particular injection for his bone marrow transplant which has to be delivered from outside India. His brother will be the donor for the transplant. Also, his DLL transfusion was completed successfully. Thank you for showing so much love and support. Please pray for his health and share the campaign. Will keep you posted! Jerit is currently admitted in hospital in Vellore and undergoing treatment. His first leg of DLL transfusion will begin from the coming weekend, we request you all to please pray for him. Thank you for the all the love and support which you have shown towards him, we shall keep you all posted.